The most notable thing - the weather which has been dry, bright, warm and sunny for days. A true Indian Summer. Today saw our first flight of broad locks since 'going solo'. It was always our intention to wait for company - so much easier with two boats in the lock. When we arrived there was someone waiting for us. I have to confess to my heart sinking when I found it was a single hander as I thought we were in for even more work than if we had been alone. However, my fears were groundless - Tony on Lydia May 3 is very experienced and super efficient. So much so, I ended up doing a lot less work than usual! Thanks Tony for all the useful lessons you taught us. Go back up the steps hanging onto the rope to close the gate and then continue forward. We guessed James and Doug from nb Chance were somewhere nearby and sure enough we passed at one of the locks. A very brief encounter, but time enough to say hello whilst Doug wound a paddle for us. A wave from James at the helm and they were gone! Another fleeting bloggers moment! In no time at all we were approaching Long Itchington a place famed for the number of pubs. Two are either side of the canal - a couple of people had said to head for this one - The Two Boats. The advice was also to move on past bridge 26 to moor - a much more peaceful location than near the pub where there was a convention of boats with Gardner and Russell Newbury engines plus a cider festival. A lovely spot, but a communications desert - no internet or phone. Once moored we headed back to the pub to have lunch - just a baguette each with a bowl of chips to share. They were so big and tasty we really did not need the chips. We were still full at dinner time, so just had a light snack rather than a full meal. We had decided to stay put, so planned on having a Sunday roast at The Two Boats. We asked on Saturday if we could book a table, but they don't take bookings. The advice was to come around midday to ensure we got a table due to the cider festival and boat convention. That was too early for us to have our main meal for the day, also we really wanted to make the most of the good weather to get some washing and other domestic chores done, so we decided we would leave eating until the evening. Big mistake! After a very productive day we ambled back to the pub around 18:30 to find that neither of the canal side pubs serve food on a Sunday evening! Back to the boat for a quick meal of bacon and eggs with some roasted baby tomatoes and mushrooms! Not quite the Sunday roast we were expecting, but very tasty all the same. We have been out since mid June and have only had one Sunday roast and that was absolutely dire! Not much time left to amend the situation. There was also one other near disaster (well for me at least) today - I dropped my Kindle Paperwhite into a bucket of warm water laced with Flash ready for me to clean the floor! I retrieved it swiftly and placed it in the sun on the back deck in the hopes it would dry and not leave me 'bookless'. I know a lot of people hate electronic readers and whilst I do miss the feel of a 'real book', I would be hard pushed to manage without my Kindle now. I need to read before I sleep and am rarely ready to turn the light out before Chris, so the ability to be able to read without a light on is such a bonus for us both. We left well alone for several hours before trying to turn it on. Would it work? It did, albeit rather reluctantly. To start with it was slow to turn the page and the internal light flickered a bit, but now 3 days later it still seems to be working. I am sure some damage has been done, but I am just hoping it keeps going until we get home in a couple of weeks. Just to be on the safe side I picked up a paperback copy of the book I am reading when we stocked up in Tesco's in Leamington Spa/Warwick (the towns are so concurrent, I am not sure which town the store is in!). Another day of locks, but unlike the Stockton flight we did with Tony, these were mostly well spaced. The first four are together - a staircase of two locks and then two singles, but the rest are just far enough apart that you need to get back on board to transit from one to the next. They were large beasts and Chris was far from happy trapped in the boat at the bottom of the lock, whilst they buzzed around his head, but he escaped unharmed. We teamed up with Mark on Fuel Boat Callisto for the next three locks, when he stopped to make a delivery. We had stopped at Stockton to take on fuel from him and, as you would expect, he made locking very easy for us. We do like to use fuel boats where we can even if they are a penny or two dearer than some places. Use them or lose them! The final three locks were done with nb Avalon who were returning to their mooring in the marina below the last lock. Parts of our route today were quite narrow and reedy - something we have not seen for quite a while. Mark, from Callisto, advised us to moor before Radford Road Bridge, No 35 rather than go into Leamington Spa. A wise decision as it was wonderful open country and very peaceful. We did walk along to B37 to the local shop there - not the best part of Leamington Spa, but the shop did cover our basic needs. A sign of yet another good day tomorrow. Monty and I, as we often do, set off ahead of Chris and we passed this trade boat selling all sorts of stuff for boaters from plants, to duck food to Ecover products and many other things too numerous to mention. Had I had any money I would have had bought some duck food which floats whereas the seed we have had all sinks! Anyway it was not to be. I was rather taken with his Herb Hospital! Today should have been easy with only two locks and a few miles to do, but what should have taken about 2 hours took nearly 3. Just a lot of moored boats including this 'selection' of boats in the centre of Leamington Spa. We have no idea how long they have been there, but they did not look as though they were in a hurry to move on. We reckon it must have been hard work getting these pins into the rather solid looking ground. There are a couple of boatyards between bridges 48 and 49 where at one point there is a set of three boats breasted up. We pulled over to let the boat coming towards us come through. It was all rather tight, not helped by the water being rather shallow. We reckon any passing wide beam boats would find passing very tricky indeed. Just as we approached the two locks of the day we passed Mark on Callisto heading back towards Stockton. He works long days - he had passed us at 06:30! We shared the locks with a hire boat - lovely people enjoying their luck in choosing this week for their holiday. The locks are called Cape Locks and the pub at the top (we were going up for the first time for ages) is call the Cape of Good Hope. With this sign! We did not stop as we were heading for the Saltisford Arm for a couple of days before tackling the Hatton Flight. So here we are moored in this oasis of calm - so very different from when we were last here in 1998! A slow start today - the washing machine is whirling round and we will head off after an early lunch to explore the Arm and Warwick. The news from our summer travelling companions is, however, not so good. nb Cleddau is stranded at Weedon Bec with alternator problems. It has been removed, sent to Daventry for testing and the results are dire - it is damaged beyond repair. Thankfully they managed to get to Weedon Wharf with an electric power hook up. Decisions and discussions about what to do next are ongoing. Once again it was warm and sunny when we set off and remained so nearly all day. I spotted this sign in one of the houses along the flight - it brought a smile to my face! Every lock was full when we got to it and most had boats coming out, so we did not even have to open the gates. Also there were two VLK's at the bottom lock, so the flight was completed in really good time and with minimal effort. As we were waiting to leave the bottom lock Monty was able to say 'hello' to Bernard the 16 week old Border Collie on Mine's a Pint. Having watered and disposed of rubbish etc we moored just past bridge 91, had lunch and then went into Braunston itself. A climb up this footpath (the church is behind the photographer) affords a good view from the top of the hill. Chris has always fancied living somewhere like this, but the boat has put paid to that dream! Our mooring in Braunston was not too good, so once we had finished shopping we decided to move on into open country. As we set off there was a very short heavy shower. By the time we were round the turn on the Grand Union mainline it was glorious again. We moored in almost complete isolation near bridge 99. We were amazed at how many boats went past and one after it was dark, but there was no footfall along the tow path - bliss. This morning was even sunnier and much warmer than yesterday - long may it continue. This is a very rural, quiet and rather lovely stretch of canal. A short trip today with just three locks at Calcutt. We stopped for water at the top lock and as we finished a boat came along to share the locks - so much easier with two boats. Andante was our partner - they were just going back to the Marina not far past the bottom lock. The lady in the picture is from a boat waiting to come up, so not part of the Andante crew. Once again we are moored in a quiet spot with, so far, no footfall along the towpath. There has been a flurry of hire boats going rather too fast, but hopefully that will not go on for much longer. The washing is drying on the line and all is well with our world. Yesterday evening we were treated to a wonderful sunset - would it bode well for today? We pulled pins about 9am, thought about stopping in Weedon Bec to shop, but decided to push on. Monty and I jumped ship there and walked to bridge 23 to get rid of some of his 'beans'. This is us waiting to be picked up - a picture I rather like. As you approach bridge 21, slow down and have your camera to hand. This is so realistic - take a good look at the hands - they are even grubby enough to be real. One bottle is Cockburns Port! Now we came past here last year, admittedly going the other way, so may have missed this, but I don't think it was there. It certainly does not appear on Boatwif's or our blog and I don't think we would both have missed it. Boatwif when you go past next week, but sure to have your camera ready with instructions to the Captain to 'go slowly'. As we passed this I was in the galley making sandwiches ready for our lunch as we had the Buckby locks ahead. Such was the visual impact that Chris, reversed and called me out with instructions to bring the camera. The sign said there was a butcher at the Heart of Shires Shopping Village just 300 yards from bridge 18. There isn't! I was despatched with money and a bag and whilst it probably is only 300 yards to the entrance, it is probably another couple of hundred yards to the actual shops. I am sure I could spend some time looking round if I had time to spare, but I didn't and it was unlikely they had anything we might have needed on the boat. Today we were aware of the railway on one side of the canal and the 'wonderful' M1 on the other - we have spent too much time on it over the years. and Jan on nb Jubilee. They said they were stopping for coffee which we would love to have joined them for, however, we had just had a coffee and with 7 locks ahead of us we reluctantly pushed on. It was good to say hello, albeit very briefly. Hopefully we can stop and chat next time we meet up. I had popped into Whilton Chandlers to ask the price of diesel - it was either 85 ppl or 89 ppl, either way it was far too much and we are not in need - we would have taken a top up if the price had been right. We have discovered that Mark on Callisto will be near the Blue Lias, Stockton when we go past on Saturday - his price 67 ppl - much better! We did stop above lock 12 to go to the farm shop (certainly worth a visit, thank you Adam) - home made (well farm made) cottage pie for dinner tonight with leek and mushrooms. We moored above lock 8 and had lunch and popped into the canal shop - a few more plaques made their way back onto the boat - another job for Chris! We completed the locks in reasonable time despite there being boats all over the place, but not going our way. There were two boats behind us and we did wait after lock 12, but they never appeared, so we went 'solo'. We are moored just after the bridge at Norton Junction in almost the same place as we spent our first night after meeting up with Cleddau last summer. That night we sat out for Pimms - a bit too chilly tonight. Also last year there were just the two of us - tonight there are boats all along the cut in front and behind us. For the first time since we left Milton Keynes the side hatch has been facing the water and we have a view. Our excitement for late afternoon was to sort out our very large bow locker - we had two bags of coal to stow away. We have discovered that the big blue Ikea bags are good for storing heavy things in the bow - they make lifting easier and help prevent rips in the bags. Next job was to light the fire. Chris laid it and lit it and then realised he had not swapped the cap for the chimney!! Action stations - him along the gunwhales to remove the cap, me to open the side hatch window to expel the smoke, dash to the stern, get the chimney, back inside and pass it through to Chris to put in place . We won't do that again!! 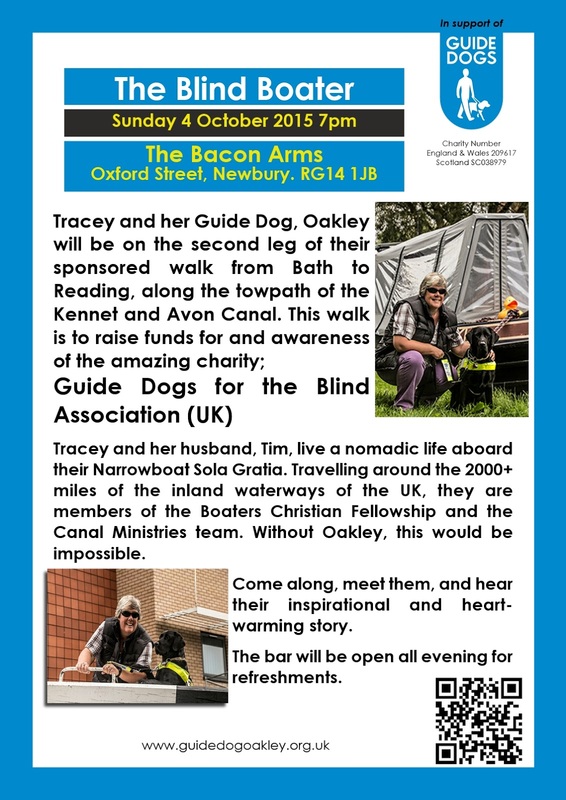 nb Sola Gratia with Tim, Tracy and guide dog Oakley will be resuming their walk on 5 October, but before they do there is a big event on at The Bacon Arms in Newbury on 4 October. If anyone is near there do pop in. If you see them on their route from Newbury to Reading do please give them a wave and wish them well. The last thing is very personal and pertinent given the said loss of Mo from nb Balmaha this week. I have a friend who I worked with for a number of years who is suffering from lung cancer. She is 42, has never smoked and has always kept herself very fit. She is trying to raise awareness that cancer can strike those who are young. If you want to know more, please have a look here to see a press release done in conjunction with Cancer Research. Although the press release says the new drug was working, I am afraid that it is now not working and she is hoping to get another new drug to help her with her fight against this awful disease. I am so pleased that Sharon and Justin we able to join us for a day on the boat from Godalming to Guildford in August.